No More Jealousy - Learn the secrets to stopping your jealous thoughts and behaviors that are keeping you from having the love you really want. One of the tricks to having all the love you could ever want is to not let what we call the “evil” enemy of love ( called limiting beliefs) get in the way of what’s possible for you in your relationships and life. Most people don’t know that there is an enemy the gets in the way of them having the love that they really want, but there is. It will do whatever it can to destroy even the most amazing relationship if you don’t understand that it is there in every moment ready to destroy your love. This enemy of love is when you believe your thoughts that turn into “bogus” or limiting beliefs. We call them bogus or limiting because you think these beliefs are real. Then you live your life and interact with the people you love and care about based on these made-up and flat-out wrong beliefs. You can’t do it if you’re living out of and believing bogus or limiting beliefs that keep you stuck in fear, judgment, doubt, and misunderstandings that create disharmony and disconnection. In the early years of our relationship, Susie remembers feeling jealous when she was out with Otto at a gathering or meeting. She’d get upset with herself and with him because somewhere inside she had adopted the bogus and limiting belief that if he truly loved her he would shine his incredible light and attention totally on her and no one else. She wanted him all to herself and of course this caused problems and embarrassment for her and for him. –Things that aren’t true, have never been true and are getting in the way of you having the love you want. 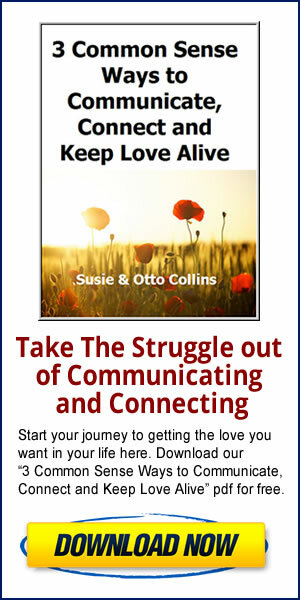 Susie came to see that Otto could totally love her AND still connect with other people in different ways. She saw that she could also open herself to connecting with others like she used to do before Otto and her life would be richer. She saw her limiting beliefs for what they were–bogus! When you see this, you no longer succumb to letting your untrue, limiting beliefs create blind spots for you that shut down the flow of love and cause separation. What if your bogus beliefs turn out to not be bogus? This is where trust comes in that you will just know deep inside you if a belief is true or not. Don’t throw love away by believing what isn’t true and acting from that place. It just pushes love away. Jealousy and Mistrust: What if you’re wrongly accused?